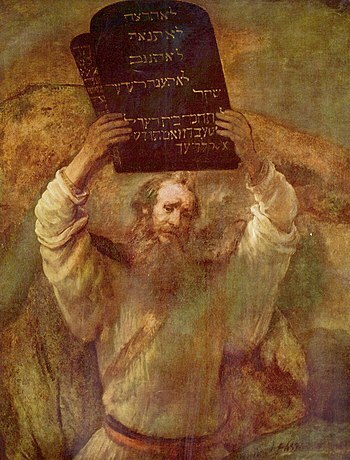 At the end of chapter 9, when writing about Solomon’s death, the chronicler tells the reader that many of Solomon’s “acts” were written about “in the history of Nathan the prophet, and in the prophecy of Ahijah the Shilonite, and in the visions of Iddo the seer concerning Jeroboam the son of Nebat.” These are evidently a few of many works of history that had been written about – most of which were lost by the time of the Roman destruction of Jerusalem, if not sooner. Nathan the prophet, we know about well, as he served David as well as Solomon. But who were these others? 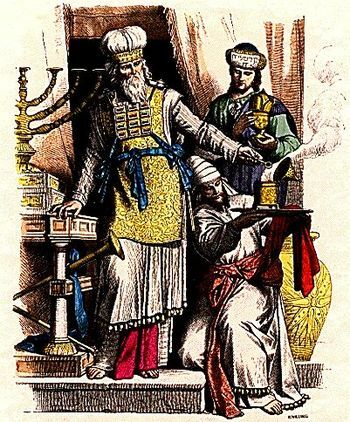 Ahijah the Shilonite was the prophet who met Jeroboam on the road and tore the garment into 12 pieces to signify the tearing of “the kingdom from the hand of Solomon” (1 Kings 11:29). Iddo the seer was another prophet who is also mentioned in 2 Chronicles 12:15, and 2 Chronicles 13:22. 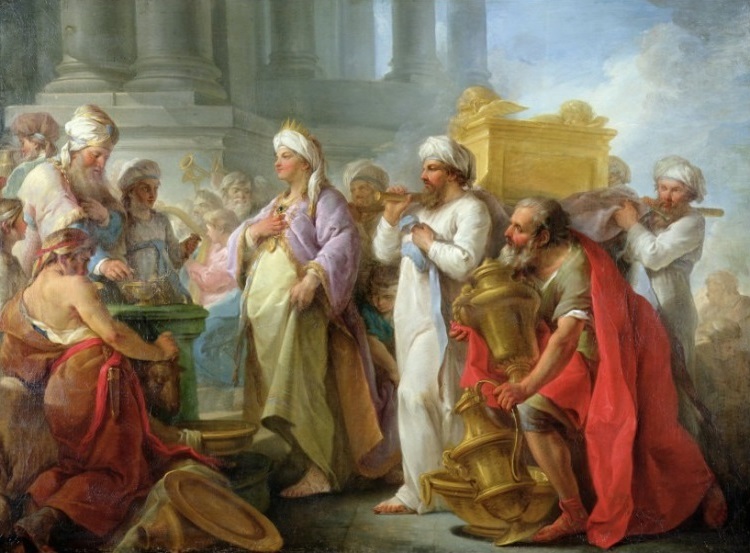 Now that Solomon has passed away, his son Rehoboam takes over as King. He travels to Shechem, where the people have gathered to make him king. Meanwhile, Jeroboam, who had fled from Solomon into Egypt (1 Kings 11:40) hears about Solomon’s passing, and his son becoming king. So he now returns from Egypt. 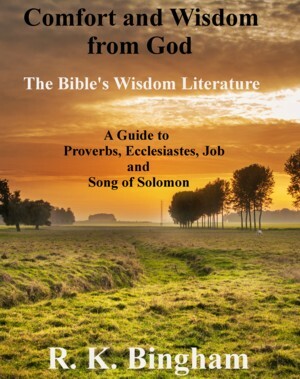 Solomon’s fame regarding his wisdom and wealth spread throughout the ancient world, even as far away as Ophir and Sheba. It is not certain where Sheba is exactly, but many scholars believe it may have been located along the Red Sea on the Arabian peninsula. The Temple that Solomon built for the Lord drew upon the vast wealth of his enormous kingdom. Once it was completed, Solomon’s Temple was no doubt one of the great wonders of its time. 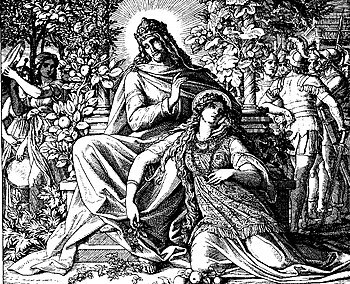 Solomon’s reputation brought acclaim and riches from many nations, but he disobeyed God, marrying pagan women and worshiping their gods. So God raised up enemies like Hadad from Edom and Rezon from Zobah (modern-day Syria). Jeroboam from Zeredah was another enemy who would eventually divide this mighty kingdom. In fact, she said that the reports she had received really understated the greatness of his wisdom. She gave the king 120 talents of gold (estimated to be about 75 pounds) and a very great quantity of spices, and precious stones. Verse 9 says that there were no spices like she had given to him. In return, verse 12 says, Solomon gave her whatever she desired. The chronicler went on to tell of the 666 talents of gold that came to him in one year (“besides that which the explorers and merchants brought“), 500 shields of gold that were made, an ivory throne overlaid with gold, and other items demonstrating his great wealth. 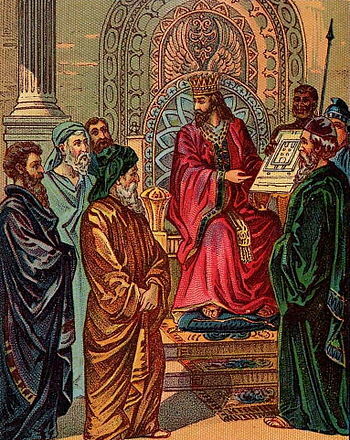 So great was his wealth and wisdom that it exceeded all other kings of every nation, and “all the kings of the earth sought the presence of Solomon to hear his wisdom, which God had put into his mind.” In fact, the chronicler says that they all brought him expensive gifts year after year, increasing his wealth. The chapter ends with Solomon’s death after 40 years as king. His son, Rehoboam reigned in his place. In the first verse of chapter 8, the chronicler tells us that it took 20 years to build the temple and Solomon’s Palace. Estimates are that this temple stood for about 410 years, when it was destroyed and Babylonian captivity began. The chronicler goes on to mention some of the accomplishments Solomon made after its completion. Verse 2 describes Solomon rebuilding the cities that Hiram had given him. These cities were actually given to Hiram earlier as either gift or, more likely, surety for a loan. That would explain why he got them back. Verse 3’s account of Solomon taking Hamath-zobah and building Tadmor in the wilderness is not recorded anywhere else in scripture. The former was located about 200 KM north of Damascus, and the latter was about 200 KM northeast. 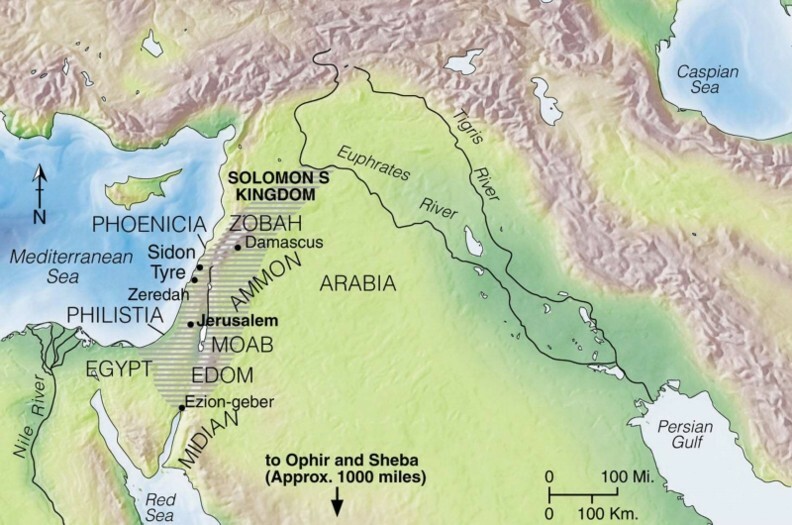 These cities of commerce represented the maximum boundaries Solomon’s kingdom would have. The chronicler goes on to recount the other strongholds Solomon built up, as well as the conscription of Canaanites remaining in the land as slaves for labor. In verse 11, Solomon brought the Pharaoh’s daughter into a separate house away from “the house of David” and the ark of the covenant because it was holy. Solomon knew that his union with foreign women was not acceptable. Verses 12-15 give us an account of how he kept the feast days and appointed the Levites to their proper duties. 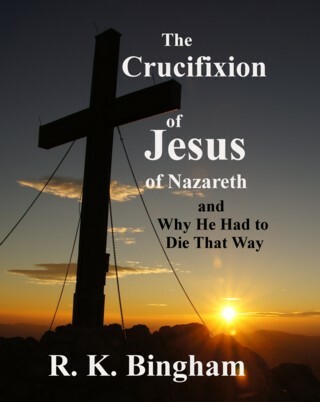 Outwardly, the kingdom seemed to be expected to follow all of God’s commandments. Unfortunately, the same cannot be said for the king himself. 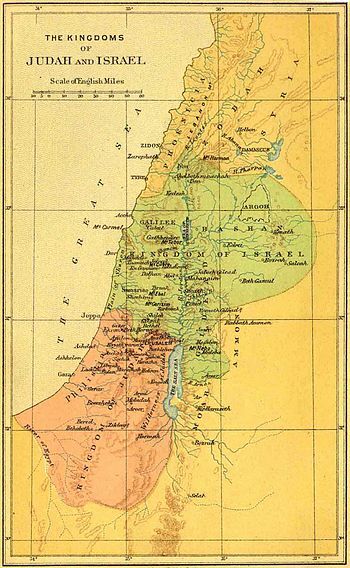 The borders of the Promised Land stretched from the wilderness of Zin and Kadesh-barnea in the south to Lebo-hamath and Riblah in the north, and from the Mediterranean seacoast on the west to the Jordan River on the east. 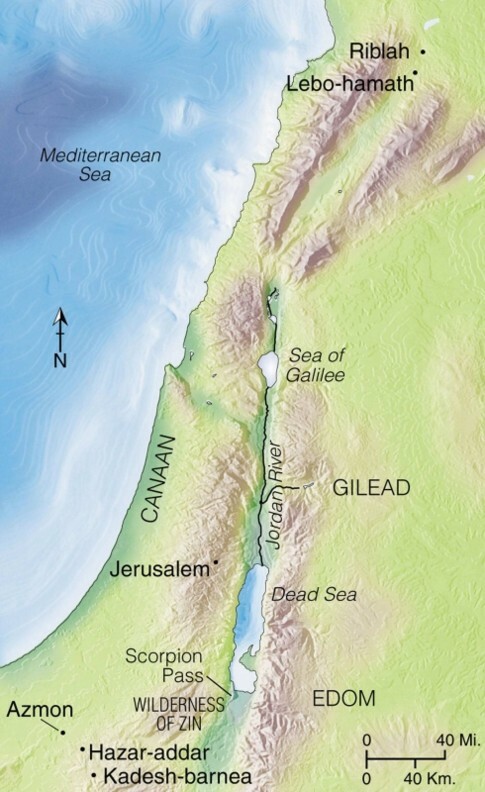 The land of Gilead was also included. 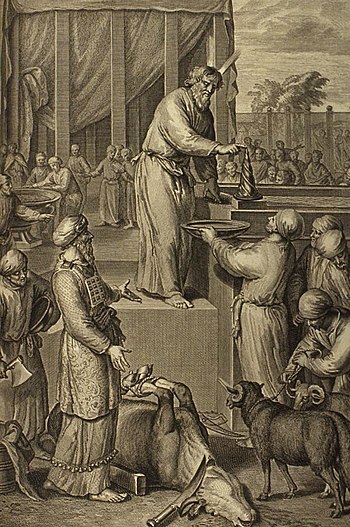 “Solomon consecrated the middle of the court that was before the house of the Lord, for there he offered the burnt offering and the fat of the peace offerings, because the bronze altar Solomon had made could not hold the burnt offering and the grain offering and the fat.” At that time Solomon held the feast for seven days, and all Israel with him, a very great assembly, from Lebo-hamath to the Brook of Egypt. And on the eighth day they held a solemn assembly, for they had kept the dedication of the altar seven days and the feast seven days. Of course, the post-exillic people that the chronicler was addressing here would know very well that the Lord meant to keep even these last promises. So9me of them had experienced it first-hand. 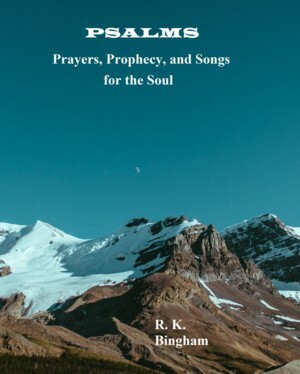 In chapter 6, the temple has been built, the ark of the covenant has been moved in, and now it is time for Solomon to dedicate it and offer his prayer to God. This was covered also in 1 Kings 8:12-50, but here in a post-exillic message, the Chronicler is less focused on the history of Moses and the Exodus and more so on the Davidic covenant. The temple was a huge part of life for those who had remembrances of how things were before exile, and those whose relatives had passed that knowledge of that life. It was a representation of their heritage therefore, and it mattered a great deal – especially now that it was lost. The chronicler does a good job with delivering the message of the day in question. Solomon’s prayer is eloquent, and exceedingly respectful. He acknowledges that no structure made by man can contain God. Still, the dedication ends with Solomon inviting God to come and dwell in the Temple. Solomon prepares for building not only the temple, but also his own palace. The chronicler mentions that fact here, but nothing else is mentioned of its construction, which we find documented in 1 Kings 7:1-12. 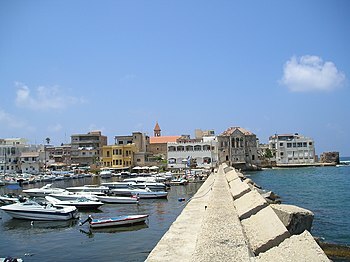 The king of Tyre was said to have had great love for David (1 Kings 5:1), and had sent cedars, carpenters, and masons to help build his house (2 Samuel 5:11). So Solomon sent the king a letter, asking for similar help, promising great amounts of wheat, barley, wine, and oil in return. Hiram responded with his own letter, praising Solomon for what he was about to do, and sent a man skilled “to work in gold, silver, bronze, iron, stone, and wood, and in purple, blue, and crimson fabrics and fine linen, and to do all sorts of engraving and execute any design.” He would also provide the timber cutters for the cedars he would send by sea to Joppa. The chapter opens with David addressing the assembly of all of the officials of Israel that had gathered together in Jerusalem in chapter 28. He tells them that Solomon is young and inexperienced, and the task at hand (building the temple) is formidable. It is only in 1 Chronicles 29:1 and 29:19 that the word “palace” is used to describe the temple. According to Albert Barnes, “the original word here used is the Hebrew form of a Persian word, and generally designates the residence of the Persian monarch,” as in Esther 1:5. But David makes it clear in verse 1 that it is not a house for a man, but for the Lord. It is then that David gives one of the last examples of his leadership as a godly king. He tells the assembly of the precious metals that have been provided and also of the large amount of treasure from his own personal wealth that he has donated to the cause of building the Lord’s house. He then asks those assembled who among them will give of their own possessions for the Lord. The result is a huge unifying onslaught of reverent generosity that gives the people great joy. David then offers a prayer to God in verses 10-19. It is a humble prayer of thanksgiving and worship for the Almighty – to whom all of these things they have given actually belong. This was followed by thousands of burnt offerings and drink offerings, and all sacrifices were accompanied by a great feast and celebration. This is quoted from God’s charge to Joshua in Joshua 1:9 and also from Deuteronomy 1:21, and it is meant to encourage the young heir in the face of the most important task of his life. But he was not left to his own devices, for David gave him the plans for the entire thing in verses 11-19 in intricate detail – as the Lord had given it to him. Just as was the case with the Tabernacle that Moses had to rally to construct in splendid detail, God provided the “blueprints” for the house that David’s son was to build with the help of all the Levites and craftsmen at his beck and call.